"28th Congress" redirects here. For the Soviet congress, see 28th Congress of the Communist Party of the Soviet Union. The Twenty-eighth United States Congress was a meeting of the legislative branch of the United States federal government, consisting of the United States Senate and the United States House of Representatives. It met in Washington, D.C. from March 4, 1843, to March 4, 1845, during the third and fourth years of John Tyler's presidency. The apportionment of seats in this House of Representatives was based on the Sixth Census of the United States in 1840. The Senate had a Whig majority, and the House had a Democratic majority. May 24, 1844: The first electrical telegram was sent by Samuel F. B. Morse from the U.S. Capitol to the B&O Railroad "outer depot" in Baltimore, Maryland, saying "What hath God wrought". March 3, 1845: For the first time, Congress overrode a Presidential veto. An act relating to revenue cutters and steamers was thereby enacted as the last Act of the 28th Congress: session II, ch. 78, 5 Stat. 795. During this congress, two Senate seats were added for the new state of Florida. Following the 1840 United States Census, Congress reapportioned the House to include 223 seats (5 Stat. 491). During this congress, one House seat was added for the new state of Florida (5 Stat. 743). Senators were elected by the state legislatures every two years, with one-third beginning new six-year terms with each Congress. Preceding the names in the list below are Senate class numbers, which indicate the cycle of their election. In this Congress, Class 1 meant their term ended with this Congress, requiring reelection in 1844; Class 2 meant their term began in the last Congress, requiring reelection in 1846; and Class 3 meant their term began in this Congress, requiring reelection in 1848. Representatives are listed by their district numbers. (1) Vacant Senator Alfred O. P. Nicholson (D) resigned in 26th Congress. (2) Vacant Failure to elect. (1) Vacant Senator Reuel Williams (D) resigned in previous congress. (3) Alexander Porter (W) Elected but, due to ill health, never took his seat. Incumbent died January 13, 1844. (2) Samuel McRoberts (D) Died March 27, 1843. Successor appointed December 4, 1843, to continue the term until an election. 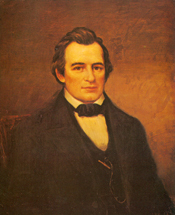 (3) Lewis F. Linn (D) Died October 3, 1843. Successor appointed October 14, 1843, to continue the term until an election. (1) William Sprague (W) Resigned January 17, 1844. (2) William R. King (D) Resigned April 15, 1844, after being appointed U.S. Minister to France. (1) Nathaniel P. Tallmadge (W) Resigned June 17, 1844, after being appointed Governor of Wisconsin Territory. Successor was appointed November 30, 1945. (2) William S. Fulton (D) Died August 15, 1844. (3) Silas Wright (D) Resigned November 26, 1844, after being elected Governor of New York. (3) Henry A. Foster (D) Appointee was not nominated for election. (1) New state: Florida admitted to the Union March 3, 1845. (2) New state: Florida admitted to the Union March 3, 1845. Congressional Directory for the 28th Congress, 1st Session. Congressional Directory for the 28th Congress, 2nd Session.